This is a new and very unique finely crafted solid copper magnetic bracelet. 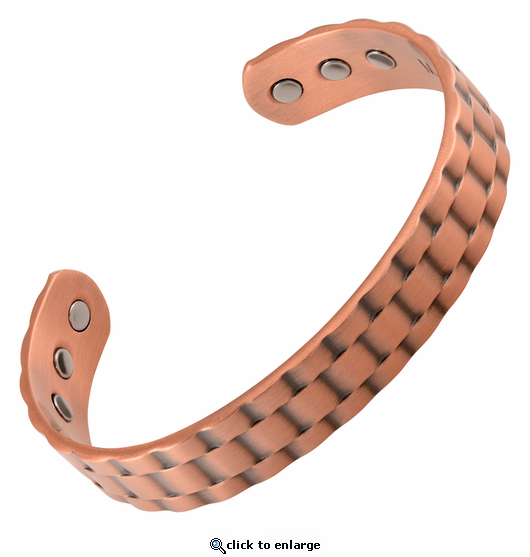 This therapy bracelet is styled in burnished copper and ripple design, it has 6 powerful 3000 gauss neodymium rare earth bio north facing magnets and stainless steel magnet caps for added durability. This nickel free copper magnetic bracelet is so substantial at about .60" wide, you do not need the gold of sunshine to see it :+). Pain in my elbow is gone and I'm happy with the bracelet. The company was great to work with and service was timely! I had wanted a copper bracelet for a long time. Fianlly ordered a cuff one but it was not for me but after I ordered it I saw the copper link one. I loved it. Got it soon and have not taken it off since I got it. It has more magnetic power than many as it is wider. The more magnet the better. Plus the copper to help more than stainless. Get one - you'll love it!!! I am now wearing my bracelet all the time...I think it works to ease my pains...My Wife and I gave a number of similar bracelets to friends and family for Christmas...So far they all like them. Very pleased with the look and quality of this item. Wish I'd gotten it sooner! I bought it for my husband who has arthritis in his hand and he said that his knuckles feel better and they aren't swelled any longer. This is a very substantial bracelet! The copper is at least one eighth of an inch thick. That may not sound like much, but when you wear it, it has a nice weight to it. It's very attractive and has a nice finish. I bought this to replace another magnetic bracelet that lost out in our yard somewhere (it had a snap clasp and that's why I bought a cuff bracelet this time). I only take it off for showering and I do notice improvement in the arthritis in the hand of the arm I wear it on. I have less pain. Purchased for hubby. He has only had it a few days but wears it always except when showering. He hasn't noticed much improvement with arthritic pain yet but I do notice a little less movement in the tremor of the left hand. So we'll see what happens after a couple of weeks. It seems very durable and is quite attractive. It is great and helped my swollen arthritis stricken finger. NIght and day difference! This was shipped fast and came just as advertised. I have been wearing it 24/7 and seems to be helping my arthritic fingers.. I would recommend this to anyone who suffers from arthritic conditions. Very sturdy and comfortable to wear. My Husband is 100% satisfied with his bracelet. It's quite substantial in weight, fits him perfect, and he said he can feel the benefits of the magnets and copper already. I will recommend your company and products. Thank You. I bought for my husband. he wore it and said it did not do anything for his shoulder. Retruned the bracelet. Reply by MJS: This copper bracelet has 6 very strong magnets on it. We are glad to accept your return or exchange. It seems he has not had long enough to give a fair chance? Did you read the info we include? Did it fit properly and did the magnets rest against the skin? Did he try on each wrist? Did he remove for a time and try again? Having the right size and following these instructions often make a difference. I purchased this bracelet for my elderly mom. She loves it. This particular bracelet is rather wide and very substantial - very attractive; I think it would be very appropriate for a male. So far, I have purchased 4 bracelets, 4 anklets and 3 rings recently from the Magnetic Jewelry Store and have been very pleased with the quality of the products and MJS' prompt, courteous service. All of the magnetic jewelry has helped reduce my pain - the magnets work! He sleeps with it on so I know he loves it. When the bracelet is remove from the wrist, it looses its shape to where it is placed back on the wrist. I think I would have berrer selected the chain type of bracelet that would likely have a clasp. Reply by MJS: This bracelet is substantial and if you have the right size and put on and off like the the instructions we include with your order show, it will keep its shape very well. Seems you have the wrong size. We are glad to exchange sizes or styles. We will send you a followup email to help. I have four sons and bought each of them a copper magnetic cuff as one of their Christmas presents. This son was hard to but for as he is very big, big hands, big wrists, huge feet, you get the idea! I selected this style as it is wider and very masculine which I thought would look balanced on his wrist. I bought the extra large size and it fit perfectly! He is not usually into things like this but looked at the reviews and information and has not taken it off since he opened the present! I love this item. I put it on as soon as it arrived and I haven't taken it off. It has really been easing the pain that I had experienced. I would recommend this item to everyone.